Karl Fritsch will give a floor talk at Objectspace on Friday 4 November at 5.30pm. The jewellery in Rings Without End is some of Fritsch’s newest work, espousing his playful and idiosyncratic approach to his materials. Rusty steel nails embrace a garnet in one ring, while in others jewels are embedded deep within the silver or gold, at times almost engulfed, compelling us to look and look again. The audacious concept of combining the provocatively unorthodox with traditional skills associated with jewellery history, the precious with the found, is central to Fritsch’s jewellery practice. Fritsch is interested in this juxtaposition of the prized and the prosaic, complicating our notion of the ring. Fritsch’s approach to stone setting is sculptural, exposing the act of setting and the technical work of cutting, filing and moving material. In this the setting determines the look of the ring, becoming almost more important than the stone itself. 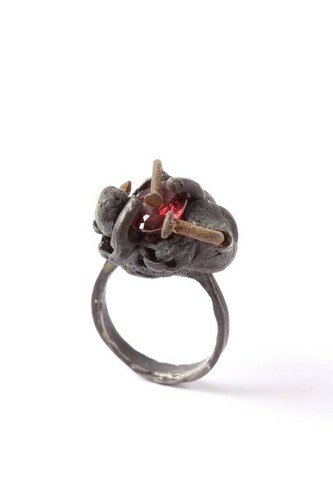 The pieces in Rings Without End have been oxidised, obscuring both silver and gold behind a coating of soot. An array of brightly coloured stones is set within this rough and rugged terrain. More of the ring is disclosed to its wearer as it is worn; the evolution of appearance a reflection of what the ring has experienced. Karl Fritsch (born in Sonthofen, Germany) studied at Goldsmiths' College in Pforzheim and at the Academy of Fine Arts in Munich. He is the recipient of a number of awards, including the prestigious Françoise van den Bosch Award (2006). Fritsch's work is included in public and private collections nationally and internationally; the Museum of New Zealand Te Papa Tongarewa, the Stedelijk Museum in Amsterdam, the Museum für Kunst und Gewerbe (Museum of Art and Crafts) in Hamburg, and MOMA in New York. He now lives in Wellington, and in New Zealand is represented by Hamish McKay Gallery in Wellington and Fingers in Auckland. Image credit: Karl Fritsch, Ring 2011. Silver, steel, garnet, dimensions variable. Courtesy of the Artist and Hamish McKay Gallery, Wellington.